A strange thing has happened to me since getting this ring on my finger – I have become interested in weddings. My boyfriend was surprised after we got engaged that I didn’t whip out some secret folder, full of all the clippings I’d been saving since childhood, sketches of my dream dress and fabric swatches, but I can honestly say that it’s never been something that has interested me. I’ve not been dreaming of my wedding day since I was small and I have no idea of what I want it to look like. Suffice to say then that the next few months are going to be a pretty steep learning curve. I have magazines, I have a planner, I have glue and scissors, now I just need ideas. One of the main things I am thinking about at the moment is colour. Having decided that I want to stick to wearing my glasses on the big day, rather than spending the whole time blinking uncomfortably, I have been toying with the idea of building an entire colour scheme around them – I don’t want them to clash after all, do I? 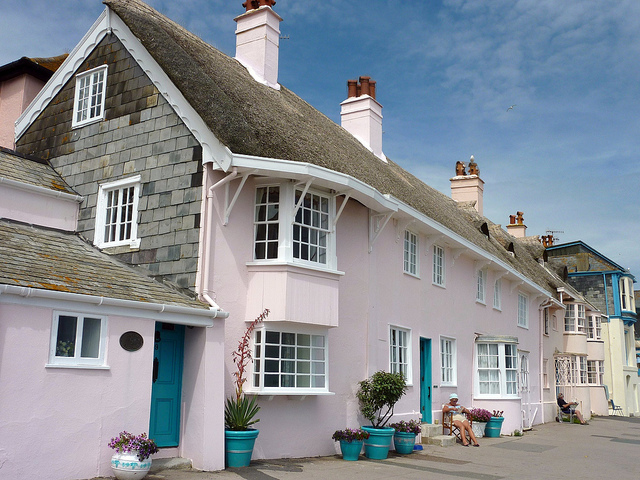 We were in Lyme Regis recently, and saw a rather lovely house where the walls were painted a very pale pink and the doors were turquoise – it was very pretty, and it definitely a colour combination I could see working with flowers and trimmings. But then you have to think about other things like bridesmaids and the groom – my boyfriend is keen on the idea of a blue suit, but doesn’t think he’s quite jazzy enough to pull off turquoise, so that’s something that has to be accommodated. 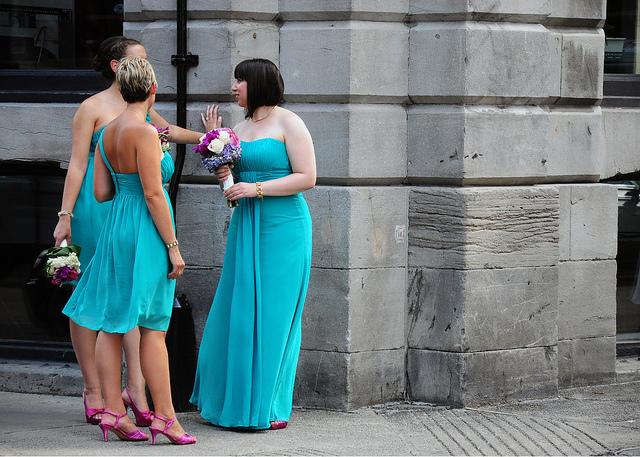 And what colours do bridesmaids even wear nowadays? Are you allowed to force friends into peach taffeta still, or have bridesmaids rebelled against that? Do they even have to wear the same?? It’s a lot to take in. I read some research from Coast that says that purple is the most popular colour for bridesmaids at the moment, with grey and silver coming second, but I can’t say I fancy any of these. Pink was only chosen by 14% of people, but is apparently very flattering for lots of different skin tones, so could be an option. Generally though I’m still at the stage where any pretty thing could catch my eye, so any advice or suggestions would be much appreciated! 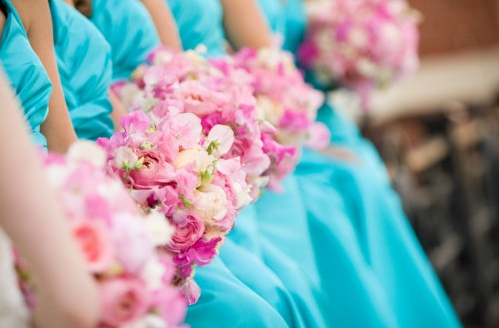 What colour scheme did you have for your wedding and how on earth did you decide?? Ooh, exciting! Love the combo and what super pics you have found. I wanted chocolate brown and pink after a Martha Stewart wedding magazine shoot but my now-husband talked me out of it- he convinced me that my eyes and hair colour would look better with gold and a bright blue. So we had gold bridesmaids (same design but as they were both young (teenagers/20something) we had separate corset-y tops and lovely long skirts that looked like a dress but so they could wear the tops another time with jeans! And blue flowers. I love the idea of the different style dresses in same hue. Depending on the suit, a blue and turquoise tie might work? My husband had a gold with blue motifs tie and the other chaps had blue with gold motifs. I got so keen on ideas from Martha Stewart that she got a mention in the wedding speeches and there’s a classic picture of me with my head in my heads as I got called on it! That’s head in my hands! Autocorrect on my phone, grr! I had 4 bridesmaids. 2 grown ups and 2 young teenagers. I’m dark so wore a deep cream/ latte dress while my big 2 wore empire line column dresses with deep green velvet tops and deep cream skirts. The little ‘uns wore red dresses with black sashes to match my husband’s red and black kilt. My mother wore a green dress and my mother in law a red one by complete coincidence so ended up being very coordinated. Chicest bridesmaids I’ve ever seen were in navy dresses. All flowers and white look fantastic against navy. Enjoy the process, it’ll come together very instinctively but beware bossy bridesmaids! It’s your wedding and your vision!